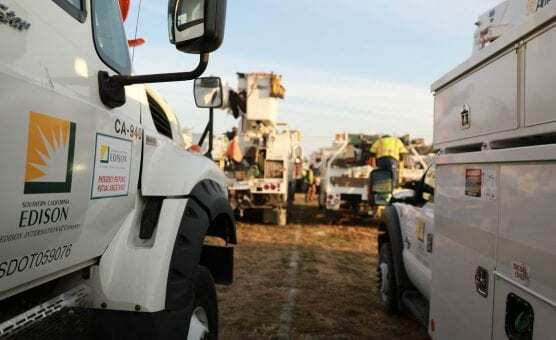 In strong wind conditions like those expected, weather-related outages are common and Southern California Edison crews are ready to respond. SCE is closely monitoring weather conditions and has activated its Emergency Operations Center. SCE is also adding staff and equipment to quickly and safely respond to any possible power outages. To see the latest information about outages, go to sce.com/outages or visit twitter.com/sce and facebook.com/sce. Customers may also report or inquire about outages at 800-611-1911. * If you see a downed power line, do not touch it or anything in contact with it. Call 911 immediately. * Power outages in the area may impact traffic signals so motorists should use extreme caution and treat all intersections as four-way-stops. * Remember to check emergency supplies to be sure you have a battery-operated radio, a flashlight and fresh batteries. * Use flashlights instead of candles to avoid fire hazards in your home or business. * If you’re in a vehicle with a fallen power line on it, stay in the vehicle and remain calm until help arrives. It is OK to use your cell phone to call 911. If you must leave the vehicle, remember to exit away from downed power lines and exit by jumping from the vehicle and landing with both feet together. You must not touch the vehicle and the ground at the same time. Then proceed away from the vehicle by shuffling and not picking up your feet until you are several yards away. * If you use a generator, place it outdoors and plug individual appliances directly into it, using a heavy-duty extension cord. Connecting generators directly to household circuits creates “backfeed,” which is dangerous to repair crews. Please consult the manufacturer’s manual for operating the generator.